My blueberry bush, happily potted on my sunny patio, responded to the winter rains with a flush of new growth and thick clusters of nascent blueberries. These are the first few with dozens more to come. Some of the red cabbage harvested recently became Asian Stuffed Red Cabbage Rolls. They were a pleasant change from the ground beef and tomato versions of cabbage rolls. 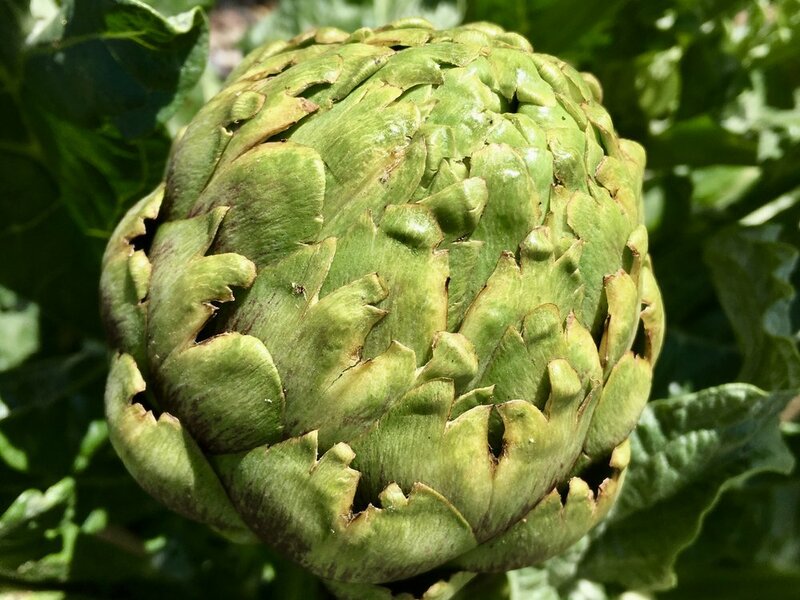 Here’s an up close look at one of the artichokes just before it was dashed to the stove for dinner. The ‘Catalina’ baby leaf spinach continues to produce well in a cooler part of the garden. I’ll be removing some of the chewed leaves today for pick up by my friend who has rabbits. I also keep some tortises happy with damaged lettuce leaves. Both also like celery and broccoli leaves and the outer cabbage leaves. Bunny poop comes back to me for the compost bin. I still have red and green romaine lettuce still but it is beginning to bolt. The ‘Freckles’ lettuce (‘Flashy Trout Back’) still increases in size without bolting. I’ve planted some seed grown summer lettuce varieties, hoping for better success than other years. Read about summer lettuce in my recent post, Growing from Seed and Transplanting Seedlings. There were more salads of course. I took the last of the white radishes that were oversized and quite strong and sliced them thinly and added to the leftover peperoncini brine. They absorbed the flavors of the peperoncini, which I’m quite fond of and made for a good end to the overdone radishes. The calendulas are in their full glory in one of the vegetable raised beds and around the yard. I’ll be drying some of the blooms soon for other uses and maybe even another calendula-orange cake with fresh petals. See what other garden bloggers harvested last week in their gardens at Harvest Monday hosted by Dave at Our Happy Acres.